What to know about telephone system connections and 25 pair amphenol connectors. 25 pair amphenol connectors can be used for a wide variety of technology. Amphenol is a term made after the Amphenol Corporation. This company was the largest seller and manufacturer of such cables. You can get 25 pair amphenol connectors in a large range of sizes. Lengths are typically from five to 150 feet, however they can be special ordered for longer or smaller. The connectors can come with females on both ends, males on both ends, one of each on either ends, or simply one connector. The term ‘male’ or ‘female’ for these types of connectors refers to which way they adapt to other connectors. You will have to be sure what you are using your 25 pair connectors for, and whether you will need a male or a female, or both. There are different brands and sellers of amphenol style 25 pair connectors. Usually prices will range depending on what length the cable is. As always, it is important to go to a reputable distributor for your connection needs. 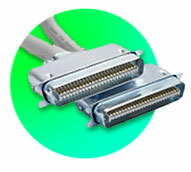 Amphenol cables are typically used for telephone systems. 25 pair amphenol connectors can be used for the connection of a telephone system to punch down blocks. Amphenol connectors are typically easy to install, if you know what you are doing. It is always important to have electrical knowledge when installing connectors, or to hire a professional electrician to do the job. Whether you work for a huge corporation or are starting up your own business, it is important to have adequate knowledge of different types of amphenol connectors and their uses. 25 pair amphenol connectors are helpful in many telephone systems and are a reliable source of connection.